With the release of Sibelius 7, education verification has changed. Information below includes all of the new requirements for this latest update. Who Can Purchase Avid Academic Products? This does not apply to Primary/Elementary school students, or students who attend courses at non-government accredited career/vocational schools. Institutions can purchase multi-seat licenses with volume discounts offered in some cases. These must be purchased with a school or university purchase order. An Avid Authorised Reseller must be contacted directly for these purchases. Academic Individual Purchasers – Who are They? University and college students – enrolled at an accredited further or higher education institution studying a course that requires no less than 2 years of full time study. Secondary school students – must be in full time education. Teaching staff – employed an academic institution. Homeschooled students and their teachers – defined by state homeschooling. Enrolment Details–student name, school name, current date/academic term. Valid Student Card dated for the current Academic term. Tuition statement, report card or letter confirming the student’s enrolment status. All details must be official and for the current academic year. Tuition statement or course bill with institution’s logo or seal and all enrolment details. Official letter from the institution’s registrar with all enrolment details. Student schedule with all enrolment details. Grade report statement or transcript with all enrolment details. Avid MAY accept screen captures from school website if no official documentation can be produced as long as all enrolment details are clear. This is at Avid’s discretion. Paycheck with employee name and school. Written confirmation of employment status on letterhead from institution. This evidence must be dated within the last six months to qualify. Curriculum receipt or official documentation issued by local/national government recognising the family’s intent to homeschool. Eligibility verification is the process of providing proof that the user meets the publisher’s requirements to install and use a product. This service makes it possible for students, faculty and staff to take advantage of their educational status. This process involves submitting proof that the customer is an academic user such as a student, teacher, faculty, or staff member. Each publisher has its own eligibility requirements and the Identit-E system will inform you of these requirements during the verification process. This opens the retail/internet channel for vendors to access EDU buyers such as students securely i.e. protecting commercial revenues, with multi-lingual validation that can be localised throughout Europe. This provides high quality customer service and a quick turn-around time. It enables the sale of discounted products to validated customers by ensuring compliance with defined verification standards. Individual’s name, address, email address, and birth date. Information concerning their educational status such as level and course of study and affiliation as a student or staff member at a specific educational institution. 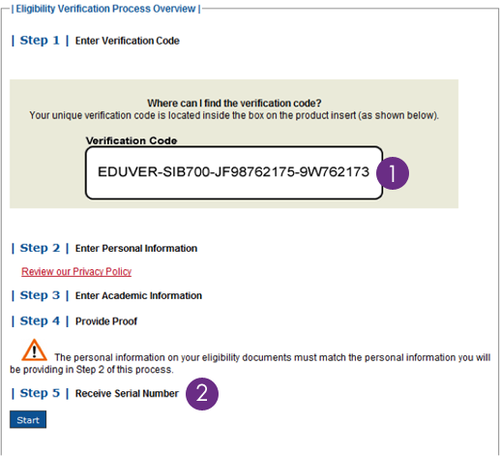 The verification code insert is located inside the product packaging. The verification code will not be found on the outside of the box. This code is used as the product identifier which will allow the user to initiate the verification process. The serial number is a unique code which is used to unlock and install the software. The product does not come with a serial number. Serial number(s) are delivered via email to the address that the user provides during the registration of their verification code. Serial number delivery occurs immediately after their eligibility is verified. Verification of eligibility occurs within 2 business days, if all required information is provided and is legible. If the customer uses their valid academic institution-issued email address for verification, processing will be even faster.